It’s always nice when something comes together well and Brian was pleasantly surprised with how easily the bucket seats fitted. Same can be said for the handbrake. 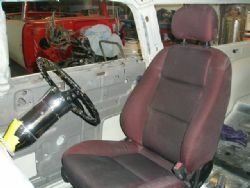 A new VZ central handbrake unit was sourced and mounts up cosily beside the driver’s seat. A couple of fabricated brackets later and it was looking sweet. In the few days that had passed the steering column had been mounted so I took out the steering wheel, boss and horn button that will guide the Nomad across the crappy roads of New South Wales and bolted it up. Everything worked as it should. The steering wheel is centred in the dash, the seat feels comfortable with an excellent driving position and the handbrake is set back far enough that it will not interfere with changing gears. 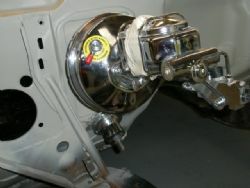 The power brake booster has been mounted on the firewall and the pedals have been fitted and aligned. I had a smile on my face sitting in the seat, holding the steering wheel and feeling the new layout for the first time. A bit like a four year old in the fire engine at the local shopping mall. There are a couple of tricks for new players. 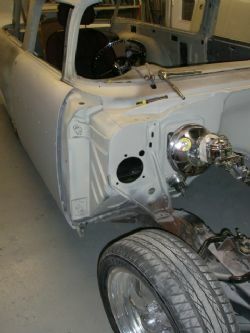 With the installation of a 1956 dash the steering column needs to reflect that – a 57 column does not fit. 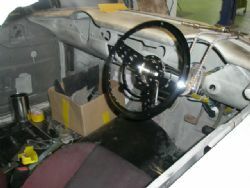 Same goes for the pedals and we had to retrofit a 56 clutch pedal that bolts straight up to the brackets under the dash. While all this was going on it seemed like the logical time to sort out the seatbelts. It is wise to install Australian compliance belts as some states mandate it and they are safer than anything produced in the US. Having done this exercise on a classic before I knew a few of the tricks but I got caught out again.